The Diocese of Rapid City, South Dakota, is seeking a Director for the Sioux Spiritual Center, a diocesan retreat facility that is located in a very rural setting, 13 miles of gravel road off the state highway and approximately 100 miles from a major city. The facility accommodates up to thirty retreatants and predominately serves the Native American population of the diocese. The successful candidate will be required to live at the SSC and serve as “care taker” for the buildings and grounds. Other duties will include marketing and promoting the retreat facility and setting up programs and retreats that serve the needs of the Native population or the diocese. He/she will be responsible for all aspects of the administration of the facility. The SSC models inculturation of Native spirituality and Catholic religious practices in the diocese. One of its programs, Basic Directions in Native Ministry, is a national program that prepares those who are serving or will serve in ministry to Native People. The successful candidate must be a practicing Catholic with strong knowledge and experience of working with Native Americans and management of a retreat facility. He/she must have excellent people skills with the ability to relate to people in extreme economic conditions and from diverse backgrounds. The SSC is governed by a board of directors comprised mostly of Native Americans from the five reservations located throughout the diocese and from Rapid City. The Diocesan Bishop is President of the BOD which usually meets twice during the year or as needed. The Director will work under the supervision and direction of the BOD. Those who are interested in applying for the position need to submit a diocesan employment application, resume and three letters of reference that indicates experience in retreat work and ministry with Native Americans. Click here for a full job description. The Diocese of Rapid City offers a competitive salary and benefits package. Position is open until filled. Click here to see the special section from the West River Catholic. When a diocese becomes vacant because the bishop has been moved, retired or deceased, the Holy See looks for a man whose gifts and experiences are best suited to serve the particular needs of that local church. In the case of the neighboring state of Wyoming, the priest selected grew up on a farm-ranch, has driven many rural highways, lived in a very similar climate, served on a Native American reservation, and worked in a post energy boom town where the mines were closed. March 16, news spread quickly — Pope Francis named Fr. Steve Biegler, 58, Rapid City, as the ninth Bishop of Cheyenne, Wyoming. The diocese encompasses the entire state. Fr. Steve Biegler was born on March 22, 1959, in Mobridge. His family owns a farm-ranch operation near Timber Lake. His parents are Alfred (deceased) and Mary Biegler. He has six brothers and six sisters, including Rhonda Nickerson, who passed away July 9, 2010. He graduated from Timber Lake High School in 1977. He attended the S.D. School of Mines and Technology in Rapid City for one year, 1977-78. “I took a day to think about life and seminary came to mind. I said, ‘Not right now, I’ll have to think about that.’ I was also considering ranching and having a family and those thoughts were part of considering the priesthood and celibacy,” said Bishop-elect Biegler. When he felt he needed a change, “I left for a little bit and went to Wyoming and worked with a construction crew filling in old underground coal mines around Glenrock near Casper. They had slurry of gravel and a compound similar to concrete. They were trying to stabilize those mines because they were caving in under the town. “The priest in the town was the vocation director for the diocese, so I did end up talking to him a little bit,” said Bishop-elect Biegler. He attended Immaculate Heart of Mary Seminary and St. Mary College in Winona, Minn., from 1986-89 and graduated with a bachelor’s degree in philosophy. From 1989-1993, he attended the North American College in Rome where he received an STB or Bachelor of Sacred Theology at the Pontifical Gregorian University. He was ordained to the priesthood for the Diocese of Rapid City at Holy Cross Church in Timber Lake on July 9, 1993. “I went back to NAC as a faculty member from 2003 to 2006, and stayed another year, 2007, and finished a biblical theology degree,” he said. From the University of St. Thomas in Rome he received an STL (License in Biblical Theology). In 2010-11, he served as Diocesan Administrator following the departure of then-Bishop Blase Cupich for his appointment as Bishop of Spokane, Wash., until the ordination of the current ordinary, Bishop Robert Gruss. “I had some experience of overseeing the diocese during that year, going out and doing confirmations — which a DA does, and I learned about the workings of the diocesan staff,” he said. “For me, I’ve come to know that priesthood is where I belong and obviously it’s demanding but it’s so fulfilling, such a great life of journeying with people in their faith. So I’m excited to continue that journey. I’ll continue it there. I am looking forward to getting to know the people and priests as a bishop,” he said. He already knows a few people in the diocese; his brother Royce Biegler and his wife, Kim, live in Gillette, and several nieces and nephews are in Wyoming. Fr. Steve Titus, the vocation director for the Diocese of Cheyenne was in Rome as a seminarian when Bishop-elect Biegler was a faculty member. Also, Fr. Andrew Kinstetter was a student at the School of Mines when Bishop-elect Biegler was the Newman Center Chaplain. His episcopal ordination will be June 5. The West River Catholic will carry more details in the April issue. Bishop Robert Gruss was a seminarian at North American College in Rome with Fr. Steve Biegler. As diocesan administrator he was the first from the Diocese of Rapid City to greet Bishop-elect Gruss when he arrived in Rapid City. Fr. Steve was the only person I knew in the diocese when I came here. He was very helpful in being the history of the diocese for me. Being the administrator, Fr. Steve could fill in the missing links in my very limited understanding of the history of the diocese as well as the current challenges that I would be facing as I began my new ministry. Fr. Steve is a very competent and gifted pastor. He has the many gifts necessary to shepherd the people entrusted to his care. I have always found him to be very wise and discerning. He has a good mind which allows him to look at a situation, dissect what needs to happen, and provide great insight into the solutions. He may not enjoy administration (many of us don’t, myself included), but I think he is good at it. He has many gifts which will be an asset as he begins this new assignment in his life. The people of the Diocese of Cheyenne are getting an exceptional priest and pastor. Bishop-elect Biegler is grounded in a relationship with Christ which guides and directs his life and ministry as a shepherd. The folks in the Diocese of Cheyenne are getting one of the best! He will be a great blessing to his new diocese. While I hate to see him leave the Diocese of Rapid City, I am honored and grateful to have Bishop-elect Biegler as a fellow bishop and a part of the Episcopacy. The church is enriched as a result of this assignment for him. I look forward to sharing this ministry of the wider church with him. Anytime you lose a priest of his caliber, it is a great loss. He will be deeply missed in the Diocese of Rapid City, both as my vicar general and as a great pastor. And given the shortage of priests that we are currently facing, it makes this loss even greater. But just as the Holy Spirit led him to this new ministry in the Church, the Spirit will continue to provide for the Diocese of Rapid City. Of this I am certain. I wish Bishop-elect Biegler only the very best in his new assignment and ministry. He will touch the lives of many people in the Diocese of Cheyenne just as he has touched the lives of many people here in the Diocese of Rapid City. He is such a gifted man and his deep love for the Lord and for the poor and less fortunate will envelop his life and ministry there as well. He can be assured of my prayers as he transitions to this new phase of his life and priesthood. Persistence pays. For the last two years our diocese has tried to organize a pilgrimage for the March for Life in Washington, D.C. However, we could never quite pull it together. Instead of giving up, we decided to team up with the Diocese of Sioux Falls and march together for life. It was great to see our dioceses collaborating, bringing our youth and young adults together to speak and act on behalf of the unborn and to call forth a culture of life. “Young pilgrims, Christ needs you to enlighten the world and to show it the ‘path to life’ (Ps 16:11). Do not be afraid to go out onto streets and into public places, like the first Apostles who preached Christ and the Good News of salvation in the squares of cities, towns and villages. ‘This is no time to be ashamed of the Gospel’ (Cfr. Rom 1:16) … Like the great Apostle Paul, you too must feel the full urgency of the task: ‘Woe to me if I do not evangelize’ (1 Cor 9:16). Woe to you if you do not succeed in defending life’ (World Youth Day, Denver, 1993). This was the first time I had ever been on the March for Life, and my experience was amazing. I did not know exactly what to expect, but I did know that I was going to be truly touched by my experiences, and this expectation did not disappoint. I was overwhelmed by the number of people who attended the march. Everywhere I looked I saw hundreds of thousands of people just like me who wanted to make a difference. Everybody was filled with joy. The March for Life pilgrimage was by far one of my most memorable experiences. The night we arrived we went to a youth rally to get us fired up and ready for the march and it was great! There was good music, some speakers and Eucharistic adoration, which was my favorite part of the rally. The following day was the march; it was amazing! Thousands of people attended, including some nuns and priests! After the march we were able to go see the monuments on the Washington Mall and to visit the Holocaust Museum. This was my first pilgrimage and afterward I felt as if God wants me to continue going on these sort of trips; it has helped me to grow closer to him and it encouraged me to keep on fighting for life. Altogether, the pilgrimage was a life changing experience. I made many friends, received a lot of graces and I look forward to next year’s march! The March for Life was a pilgrimage filled to the brim with inspirational messages and experiences; my brother Isaac and I were lucky enough to witness them firsthand. 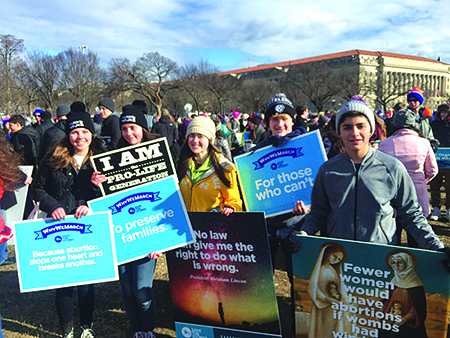 The most powerful of these experiences was seeing that we are not alone in the pro-life movement, but rather, a part of a fast-growing generation of pro-life supporters. Alongside this realization was the massive gift of patience granted to us during the trip. Specifically in the following movements: a 36-hour bus trip, standing at the rally prior to the march (stood in the D.C. chill from 9 a.m. to 4 p.m., when the march finished), and especially when nine of us were crammed into a minivan and were driven to a restaurant called “China Town,” which was half an hour away from the downtown China Town we were trying to reach. The most important message taken from this event was that we are one body, one voice (“One Voice” was this year’s theme), whether there are thousands of us joined together in a street, or one of us standing up in a classroom. We must use our one voice for the child who has none. We all have key roles in this movement, but if we fail to be participants in those roles, the change we so dearly desire will never occur and our voices and the children on whose behalf we raise them will be forgotten. So we ask: join a march, promote life everywhere you go, reach out to not just our future children, but to guard their future. Going to the March for Life was an amazing experience. It was so empowering to see hundreds of thousands of young people just like me marching to protect life. It was definitely not what I was expecting; it was better. It was so peaceful. At times when we were marching, it was almost silent. That is because we were marching out of love. I hope to attend this event in the years to come, and I encourage you to do the same because it truly is life changing. This year I was blessed with an opportunity to attend the March for Life in Washington, D.C. This was something I could have only dreamed about, but thanks to the hard work of my fellow students attending and all the support from family and friends, I was able to go. One of the things that I was thankful for was the chance to meet so many people fighting for the just cause of ending abortion. We were also blessed to travel with the Diocese of Sioux Falls and make new friends. Thanks again to all that made this possible. The March for Life was such a positive experience for me. Even though we began with some delays and bad weather, it was comforting to be able to get to Sioux Falls and join the other pilgrims as we boarded our bus and headed for D.C. The bus ride, although crowded and long, was a time for us Rapid City kids to get to know those from Sioux Falls, play games, watch movies, and spend time in prayer and reflection as we prepared to go on the march. During our times of prayer, I began to reflect on the question, “Why did I even want to come?” I answered, “I have always wanted to go, and this year I was able to get the chance,” and that answer seemed to be sufficient. These questions left my thoughts until I returned to Rapid. I now think that my desire for the pilgrimage was just to “be there.” I wanted the experience, and to be able to witness to the pro-life movement. What a gift it was for me to be able to “be there” in those moments of the trip where God showed me just how universal the Catholic Church really is. I was able to “be there” when I ran into two of my friends from college. I was able to “be there” when I got to spend some time talking to my friends from the University of Mary. I was able to “be there” when our group ran into Sr. Audree Blankartz, who is a good friend of mine from our diocese, and I was able to “be there,” in Washington, D.C., as an advocate for the unborn. I later realized that I have to be aware and attentive to God’s grace at work so that, in opportunities like the March for Life, I am able to “be there” and not miss out on what God wants me to receive. Having attended the March for Life in college, my desire for this pilgrimage was to share in the joy of my students. My hopes were realized as they experienced the larger church and the rallying support of thousands united in the cause to support life. Particularly moving for me was visiting the National Holocaust Museum. Reflecting on the cruel death of so many during that historic event, I considered the roles of those who attempted to defend the defenseless and those who stood by silently. I then considered what I am doing during the genocide of our age to stand against evil and subsequently what future generations will remember about the people of my time — did we speak for truth and dignity or were we silent? The witness by these youth and young adults on behalf of the unborn should fill us with pride in how well they represented the Catholic Church of western South Dakota. Their words and actions should serve as a reminder and an inspiration for each of us that we are to be fearless and intentional in being witnesses of the Gospel, whether it is among thousands of people on the Washington Mall, amid our coworkers in the office, or within our parishes. As St. Paul reminds us, and St. John Paul II reiterates: This is no time to be ashamed of the Gospel. By the time you will read this, the South Dakota Legislative Session has drawn to an end. One of the bills which has drawn most of my attention from an input level has been Senate Bill 149 — the Faith-Based Adoption Agency Protection Bill. This was a very important piece of legislation because it ensures faith-based adoption agencies in South Dakota the freedom to continue placing children and making decisions within their agencies that are consistent with their deeply held religious beliefs and moral convictions, which should be protected by our First Amendment rights. The bill has passed in both the House and Senate and was signed by the governor. There has been great pushback from opponents citing it as a “hate” bill or misrepresenting it as “state funded discrimination.” Our opponents either fail to understand or do not want to understand how important a role religious beliefs and values play in the lives of Americans across this country. It seems to matter little to them that this country was founded on Judeo-Christian values and appears that they will go to great lengths to rid the culture of our First Amendment Right to Freedom of Religion. With this particular situation, opponents allege that because there are religious criteria in the policy of Catholic Social Services for making placements of children into homes of loving parents, CSS is discriminating against the LGBTQ community. This is far from the truth. The opposition is agenda driven, partisan and assisted by news media who unfortunately do not seek all the facts. CSS has been providing adoption services in western South Dakota for over forty years and has always served the best interests of the children in accord with our Catholic faith and traditions. It and other faith-based organizations receive no government funding for their adoption programs — one reason why this bill is important for the sake of our Catholic ministry. The very mission of CSS is “To share in Christ’s ministry of offering hope, promoting individual human dignity and strengthening families and communities, by providing professional social services to people of all faiths in western South Dakota.” Encouraging families to consider becoming foster or adoptive families is part of their mission. Contrary to the false statement from the ACLU of South Dakota Policy Director, that “this law directly affects the hundreds of children in South Dakota awaiting their forever families,” when a potential adoptive family cannot be served because they fall outside of CSS’s policy, they are referred to other organizations who can provide for their needs. The State of South Dakota has more than enough agencies and attorneys available to provide adoption and foster care services. Every family who wants to adopt a child can find an organization to assist them if CSS is unable to do so. In fact, the opposite is true. In the case of CSS, if they are forced to make decisions which force them to violate their deeply held religious beliefs, they will close down their adoption services before violating those beliefs. Closures of adoption agencies would affect the number of families and birth parents being served. The bottom line is that the government should not be dictating how religious organizations carry out the mission of Jesus Christ in service of the Gospel. Faith-based organizations do far more than any other agencies in serving the poor and vulnerable. If those opposed to Judeo-Christian religious values and traditions are determined that the government should control the ministry of faith-based organizations, the less fortunate and vulnerable will have many fewer places to turn for services and care. I would like to personally and publicly thank the sponsors of SB 149, Senator Alan Solano and Representative Steven G.
Haugaard, for their work in getting this bill passed. They and those who voted for it have my admiration and gratitude for speaking out for religious freedom in the State of South Dakota. In today’s culture it takes courage to risk stepping out publicly on faith-based issues. Doing so, as Jesus warned us, has made these brave legislators the subject of persecution (Jn 15:20). Thank you for being courageous in spite of the persecution and derision you received from the opposition. It shows your true character. individuals who serve others through CSS and all faith-based organizations across our state. Thank you so much! Religious freedom is not only about Catholics being able to attend Mass on Sundays or enter into private prayer, but it involves whether we can make our contribution to the common good of all Americans. It is about the ability to continue to do the good works the Gospel of Jesus calls us to do without having to compromise our Catholic faith. State funded adoption agencies and faith-based adoptive agencies have worked together for many years helping thousands of children find loving homes in South Dakota with an admirable tolerance of each other’s beliefs. Little by little, those opposed to Christianity have become intolerant and are trying to impose their beliefs on society. They believe that, because our ministry is guided by Gospel and traditional family values, there should be no place for it because they don’t like it. We will continue to fight for our First Amendment rights. Senate Bill 149 is an important way in which we can carry out the mission of Jesus without others telling us how we must do it. This fact remains, even with the passage of this legislation: no one will be denied the opportunity to share their love for a child through adoption.